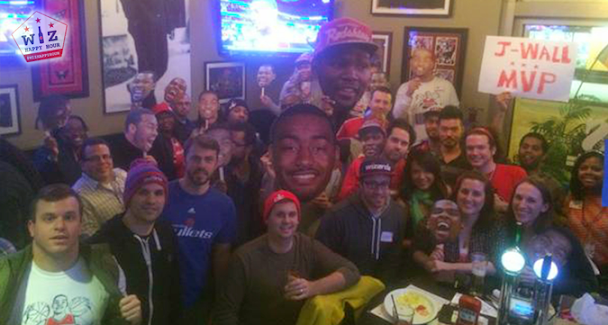 Wiz Happy Hour is a group of die hard Washington Wizards fans who meet up for drinks at various bars, restaurants, and events to root on their favorite NBA basketball team. We meet for happy hours, play games, give away prizes, and do a lot of fun and wacky bits to grow the Wizards buzz in the area. The idea is to bring the passionate Wizards fan community together both online and in person to create a unique and exciting social experience not often associated with basketball fandom. 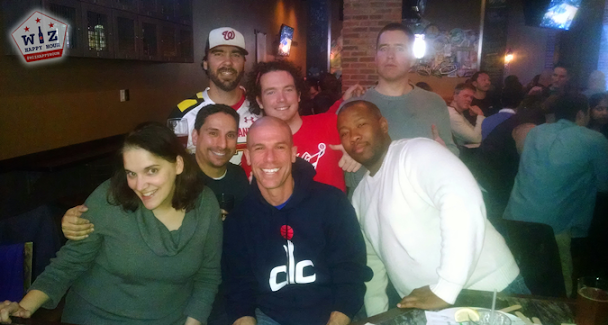 While a passion for Wizards basketball is the foundation of the group, there is a secondary persuit; to discover food & drink specials, sample new craft beers, and explore the DC Metro area happy hour & nightlife scenes. You can think of us as a college football alumni group filled with enthusiastic people who went to Wiz U. We will never abandon our alma mater and we are proud to wave the school colors, Red, White & Blue all across the DC Metro area and beyond. 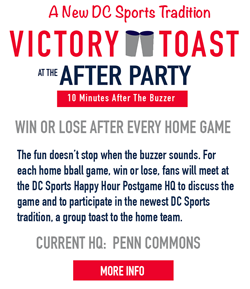 Whether it be meeting up for drinks at a pregame happy hour to joining up together at a bar for an away game watch party we always have two goals in mind; To have fun, and to support the Washington Wizards. Pregame Social Happy Hours: These are brief one hour weekday meetups that typically take place at the smaller and cozier venues in the area. They are very low key and a great way to explore area happy hours. Pregame Tailgate Happy Hours: These extended happy hours take place mostly during weekend games or before bigger name opponents. We get a little more wild at these and we often do some extra prizes or fun. 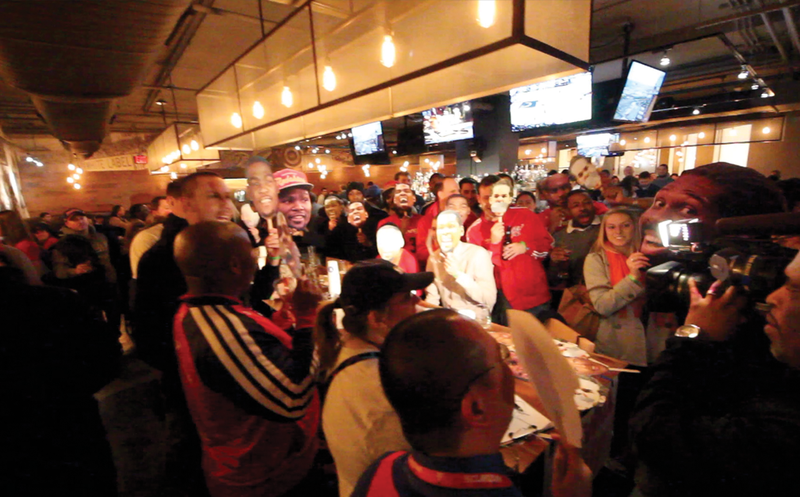 Wizards Bar Tours: The Wizards organization hosts a few (poorly organized) bar crawls throughout the season. We like to join in on these with our own little twist. Postgame Discussion: After many home games a contingent of Wizards fans heads out of the arena and next door to Clydes for their late night happy hour, and to discuss the game. If you would like to see us hit up a specific venue or have connections with a local establishment that would like to host us, contact us. Special Event Watch Parties: These are our special events that we hold every so often at places all around the DMV. We have the game audio, play games, do wacky bits, enjoy specials, and watch the Wizards. These are big time events, mostly on weekends, that often last well beyond the end of the game. Low Key Fan Watch: These are where we gather together a group of Wizards fans and meetup to watch random away games. These are usually smaller and more low key meetups, often last minute. Bar-Sketball Bar Crawls: These are a unique adventure created by Wiz Happy Hour. We pick a game and watch it while travelling to 4 different bars (1 bar per quarter). We play games and give away prizes along the way. If you want to bring a watch party to your area, if you have connections with a local establishment, or if you work for an establishment (that has TVs and will put the game sound on) contact us. The idea behind Wiz Happy Hour comes from two questions we proposed after examining two very frustrating practices that have been taking place in the are for several years. For years Wizards fans have gone to bars, restaurants, & parties and had to beg and plead just to get a Wizards basketball game on a single television. After getting dirty looks and heckled by whoever was around to hear the request, they would spend the night smashed into a corner on a tiny television anti-socially watching as the dirty looks and comments continued. Perhaps it was having to ask a bartender to change a TV from CNN to a Wizards playoff game at an establishment 100 yards from Verizon Center where the team was actually playing the game, but at some point I knew this behavior had to change. Secondly, we noticed that when Wizards fans are watching games, they are often in very small groups, if not the only person or persons in the establishment watching the game. This causes individuals to remain quiet because it is embarassing to be the only one clapping or cheering. Have a thought about a bad call or a coaching decision? There is nobody there to listen. Compare that to an NFL Sunday when you are surrounded by dozens of fans of your team. The football bar crowd enviornment is loud, fun, and exciting. It is almost like you are at the game. Well soon enough Wiz Happy Hour was born with the goal to tackle the challenge of answering those two questions. The space is spectacular and this venue is just what we needed for our event. It is the best event space San Francisco to have an event and we had an awesome experience here. Their staff is excellent; they are so attentive to all of your needs.